Summer will always be painted in everyone’s mind as a vividly colorful season and everyone is enthusiastically creating their own sunshine. This time of the year can also be a great excuse for every woman to play with patterns and go gaga with chromatic and huge prints. To all the queens out there, do you want to have fun with fashionable and colorful accessories and bags this sunny season? Fret no more because America's top handbag designer Vera Bradley has introduced the four new color patterns of modish handbags that will surely make any lady cut a dash this summer! 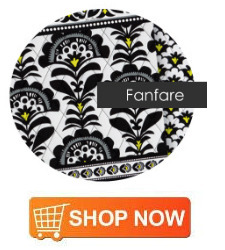 One of the new colors of the 2014 Vera Bradley Summer collection is Fanfare. A fusion of classic and modern scent is what this color pattern has to offer. These handbags, having the tints of black and white with a flash of neon blush, will surely captivate every lady with its perennial beauty. Additionally, a subtle tint of yellow incorporated into the hues of the design reveals a spark to an appealing neutral scheme. It can also hint a professional and formal facade for the ladies who want to bring the handbag not just to the beach, but also to their offices. The Fanfare comes with different styles and signatures. Moreover, this new pattern are also available in Tic Tac Tote, Pleated Tote, and Large Straw Tote. Next up in the new collection line is Flower Shower. Floral prints and glistening sunshine will always come together during this season and a best companion to take with you is this Flower Shower carry-on. It has blossoming patterns and nostalgic chrome that will remind you of the ocean breeze and the bright sun. Large floral motifs and leaves painted prominently in coral, brown and turquoise, will take you to the beach with palm trees in front of a clear blue sky. Ladies would surely love its versatile pattern that can be transitioned for a different season because of different colors at hand. 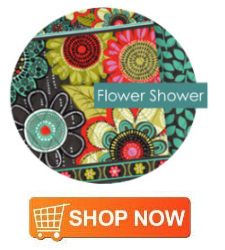 Flower Shower is available in different styles and comes with different contours like round duffel, summer tote and even a travel jewelry organizer. With the new floral pattern Flutterby, a breath of fresh air and a sweet pattern in a lavender color is what the Flutterby offers to every duchess out there. It has a blissful palette of playful and fluttering hues that must be included in the list of your summer requisites. Also, it jives with the newly installed adorable Baby collection that’s really perfect to showcase the youthful and fresh designs. The blooming wild flowers and fancy butterflies coming all together in an orchard of turquoise, purple, citrine, and orchid will definitely make the girls cut a fine figure. 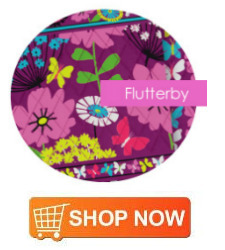 Flutterby comes with a variety of styles and it also has different silhouettes to offer such as the Tablet Case with stand, Drawstring Crossbody and Neoprene Tablet Sleeve that the gals will surely love. Our final summer pattern is Petal Paisley. Brace yourself for a classy and stylish pattern laid on top of a functional background. 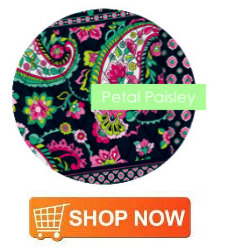 The Petal Paisley can be the girls’ favorite and go-to pattern not just in summer but also in spring and fall. The navy blue base complements really well with the bright green, dark pink and raspberry accents, bringing a pop of bright modern-vintage feel. Moreover, classic paisleys and blossoms ignite a luscious arrangement, making this pattern stand out. There are several styles to choose from such as the crowd’s favorite elephant design. The new color pattern also comes with Pleated Shoulder Bag, Scalloped Hipster, and Cargo Sling. 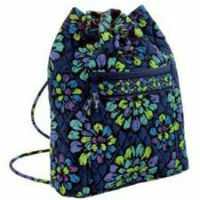 To go with traditional jeans and graphic tees is a Vera Bradley Backsack in Indigo Pop. Play with colors as you mix and match tops and bottoms to go with your new bag. You can wear shirts in complementing blue, green and violet shades, e.g. : cobalt, purple, mauve, lavender and lime. Carrying a backsack is most convenient when you want to keep your hands free to carry important items as a mobile phone or a pen. This will be great for a college student. A backsack is a coed's ideal choice. When traveling, bring along a bag large enough to carry your personal essentials. Travel basics include: passport, credit cards, camera, music player, scarf and reading materials. 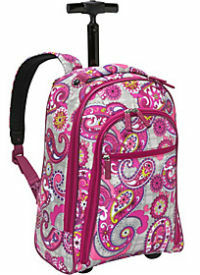 For this specific requirement, carry with you a Vera Bradley Rolling Backpack or Market Tote. The former gives you hands-free access to a zippered opening that you can pull behind while the latter allows you to keep your bag close to the body (to insert in-transit purchases). When visiting family, bring along a Vera Bradley Three-O Tote in Paisley Meets Plaid Design. A pink or fuchsia dress would go well with this chic yet practical bag. You can shoot-in and pull-out items easily from this Vera Bradley (with its perfectly-sized interior) -- like a spare blouse or a surprise gift. These bags are also available in elegant softness of microfiber that makes them versatile for any occasion. 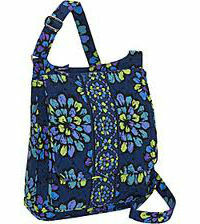 Take along a Vera Bradley Mailbag with Indigo Pop print when out with friends. Sling it around your shoulders to keep it from being a bother as you enjoy your girl-friends' company. Some casual activities when using this bag include: a movie afternoon, shopping at a flea market and having coffee in an open-air cafe. A night with a loved one should be worry-free. You need only to bring the barest of essentials as your mobile phone and cash. 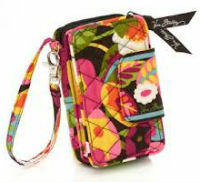 In this case, you may simply opt to bring a Smartphone Wristlet in Va Va Bloom design for your cell phone. If you feel the need to bring more items, Vera Bradley's On the Go model in the same pattern is another perfect bag for your exciting date. 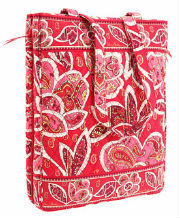 Bring with you a Vera Bradley Laptop Travel Tote when you want to take your PC with you on casual trips. You may wish to get all three Fall designs so you have options, choosing the one that matches your outfit choice best. 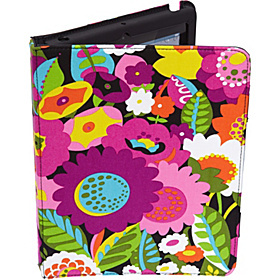 If you travel with a tablet like an Apple iPad 3, you will want to consider protecting your iPad with Vera Bradley's new Tablet Folio available in the new Fall colors like Va Va Bloom. These iPad folios are both pretty and practical for use. These are great gifts for students and young women who use these tablets often. 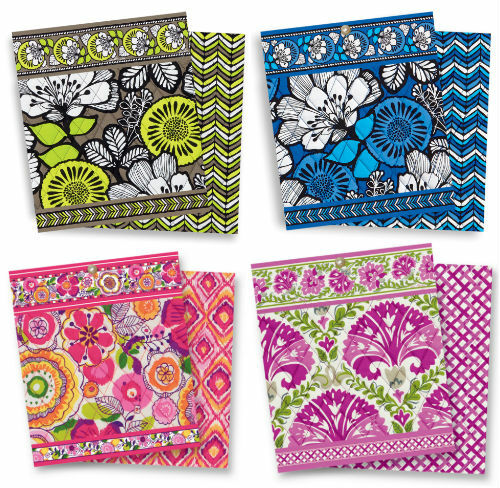 Your personal preferences and tastes determine the Vera Bradley bag type and design you choose each day, making lifestyle decisions to highlight your unique or distinct personality. Having Vera Bradley women handbags in your closet allows you to be fashionably perfect every time you go out! If you are searching for the best deals, browse through our menus to find the best Vera Bradley sale outlet selling your favorite handbag! Check out the new Spring Colors for 2014!